DRS 57307 with 'Cable Thefts We're Watching You' branding rounds the curve at Yate on the approach to Westerleigh junction hauling the 1Z16 Bristol Temple Meads to Bristol Temple Meads Northern Belle via Worcester and Swindon. 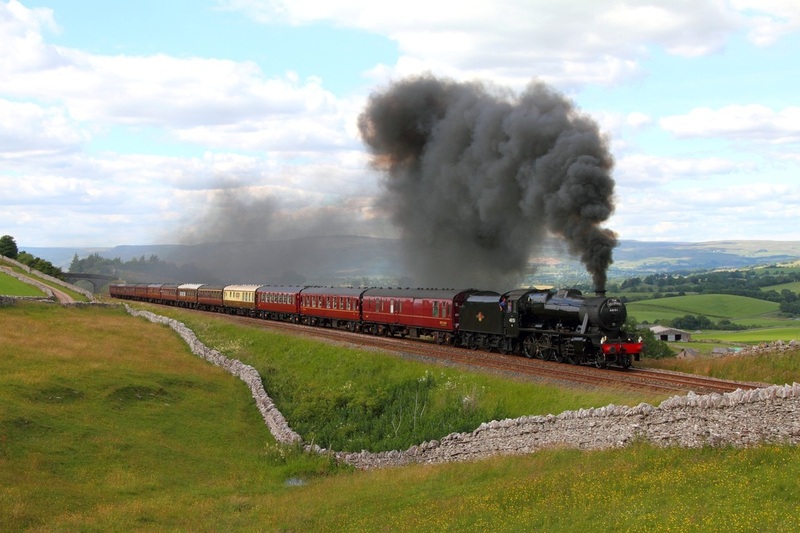 The train was planned to reverse at Gloucester which didn't happen. 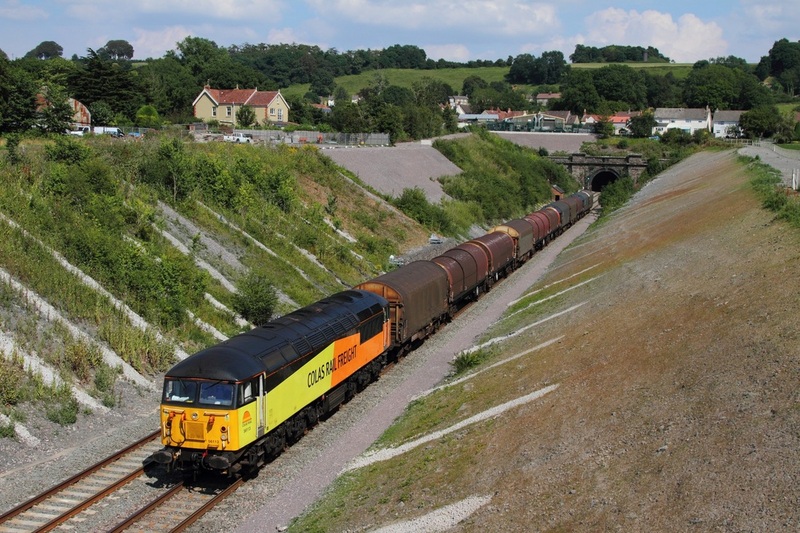 This originally would have meant 47841 leading to Bristol Temple Meads. At Bristol Temple Meads, the train reversed again to take the Bath line to Swindon, in which 57307 ran round the train and led 47841 to Swindon indicating there were problems with 47841. 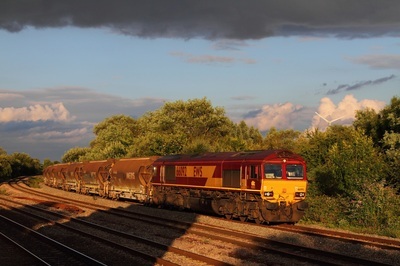 57307 had replaced 47810 yesterday which also had problems. Many thanks to LusitaniaD225 for his help. 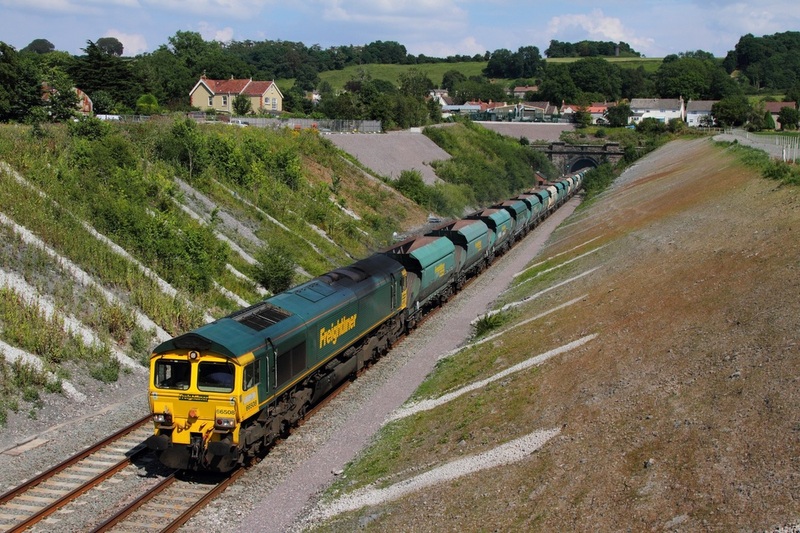 Freightliner's 66508 hauls the 6V33 Neasden to Pengam at Chipping Sodbury on the 26th July 2014. 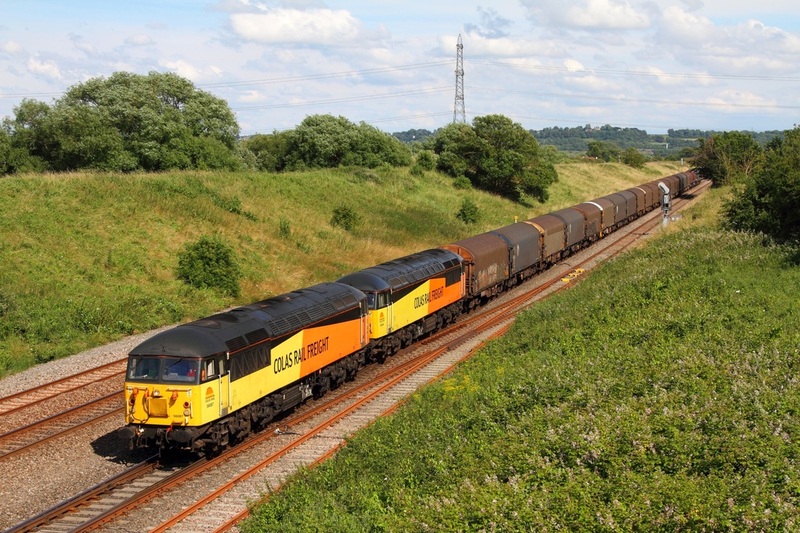 Colas 56113 hauls the 6V62 Tilbury to Llanwern at Chipping Sodbury on the 26th July 2014. 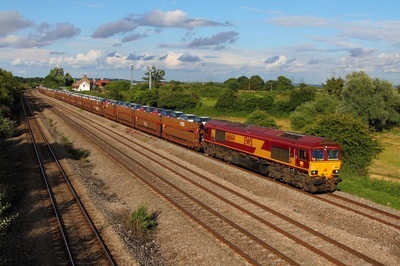 WCRC 33029 hauls the 5Z36 Southall to Kingsland Road, Bristol at Shrivenham on the 26th July 2014. 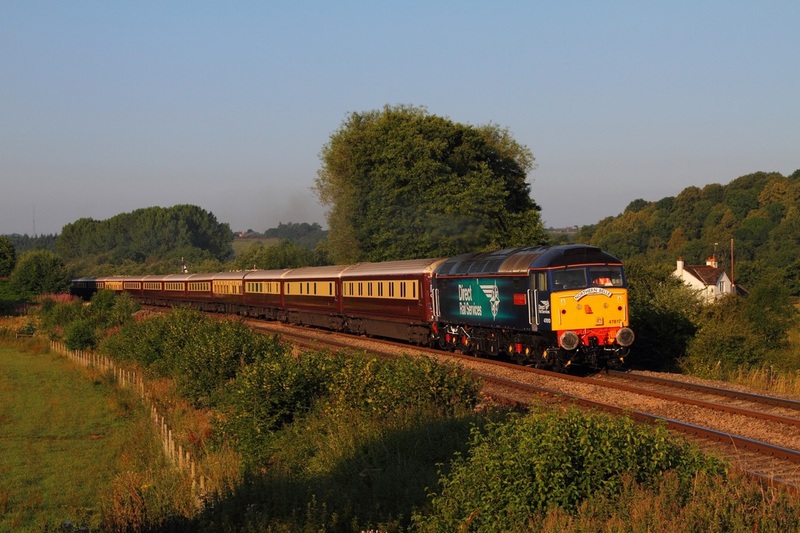 The ECS is for the Weymouth Express which operates on Sundays. 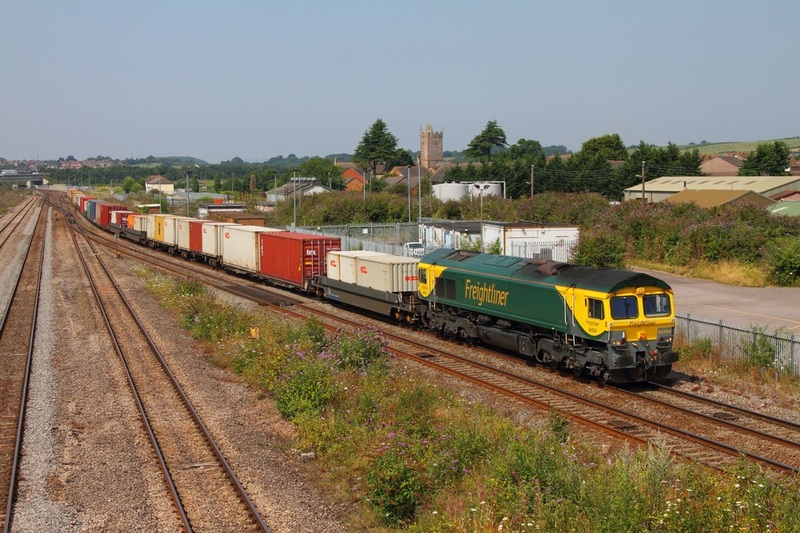 Freightliner's Powerhaul liveried 66504 hauls the 4O51 10:58 Cardiff Wentloog (now retimed to work an hour later) to Southampton freightliner, captured here at Severn Tunnel junction on the 25th July 2014. 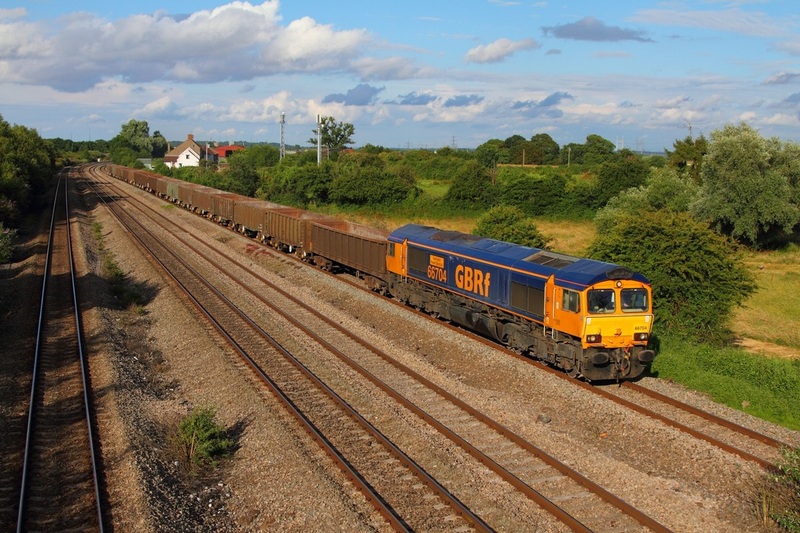 GBRf 66724 hauls the 6A82 Cardiff Tidal to Moreton on Lugg at Pontralis on the 25th July 2014. 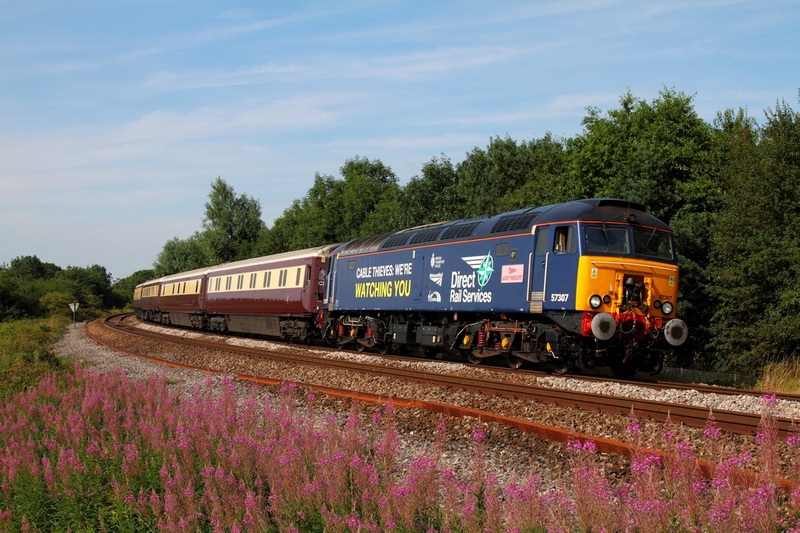 DRS new class '68' version liveried 47810 leads 47841 on the 1Z84 Cardiff Central to Oxenholme Northern Belle at Pontralis on the 25th July 2014. 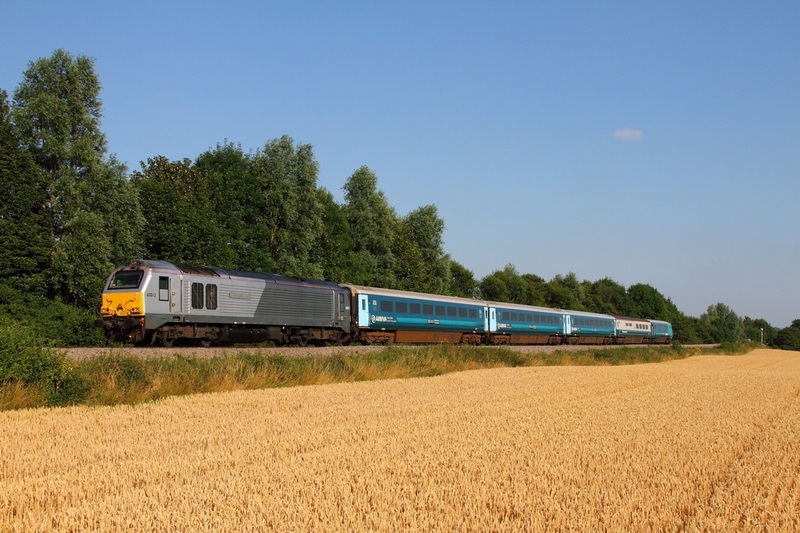 DB Schenker's Chiltern Railways liveried 67012 leads 82307 on the 1W96 Cardiff Central to Holyhead 'WAG' express at Llanellen, Abergavenny on the 24th July 2014. 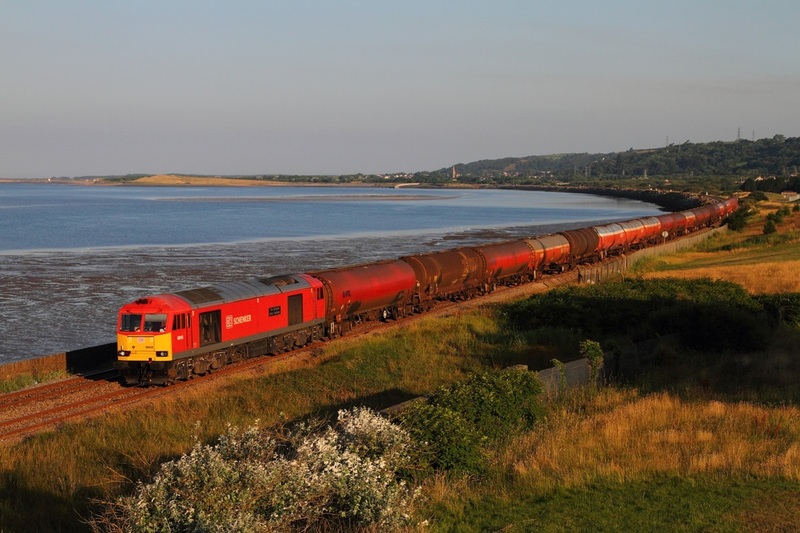 DB Schenker's 60040 leads the 6B13 Robeston to Westerleigh tanks at Pwll, Llanelli on the 23rd July 2014. 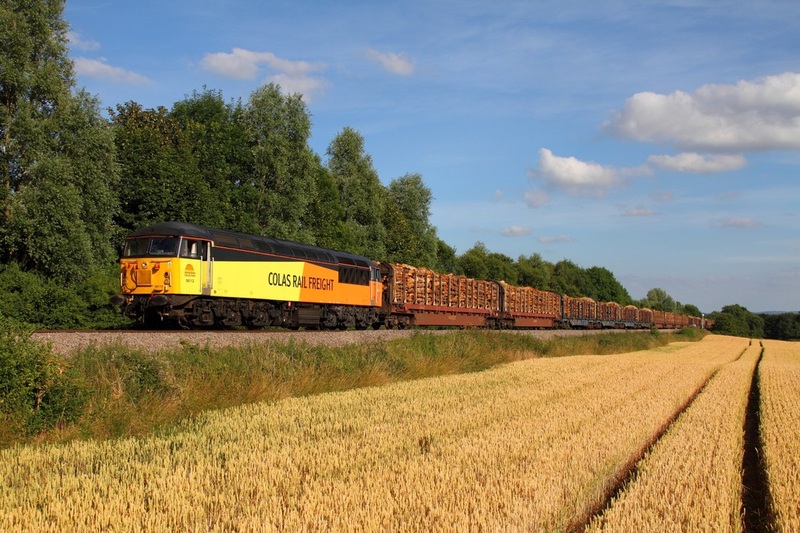 Colas Rail 56113 hauls the 6M51 Baglan Bay to Chirk loaded timber at Llanellen, Abergavenny on the 22nd July 2014. 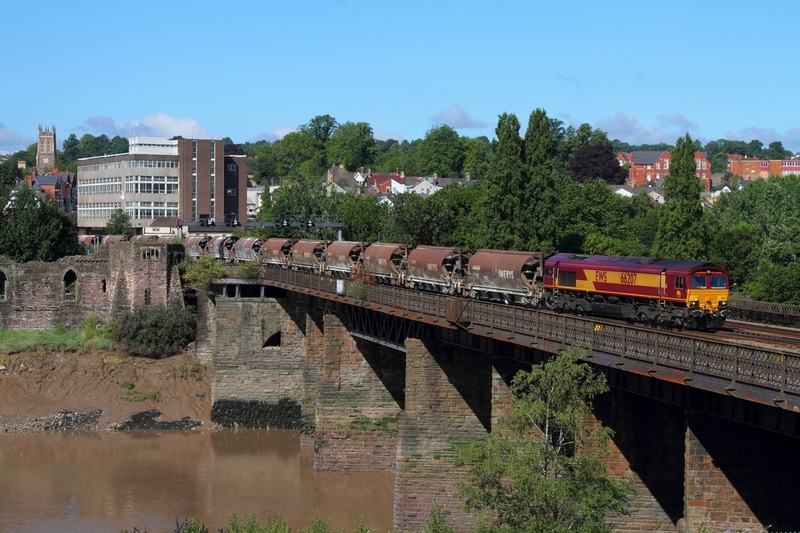 DB Schenker's EWS coloured 66207 works the 6Z60 Newport A.D.j to Bescot loaded china clays over the River Usk at Newport on the 20th July 2014. 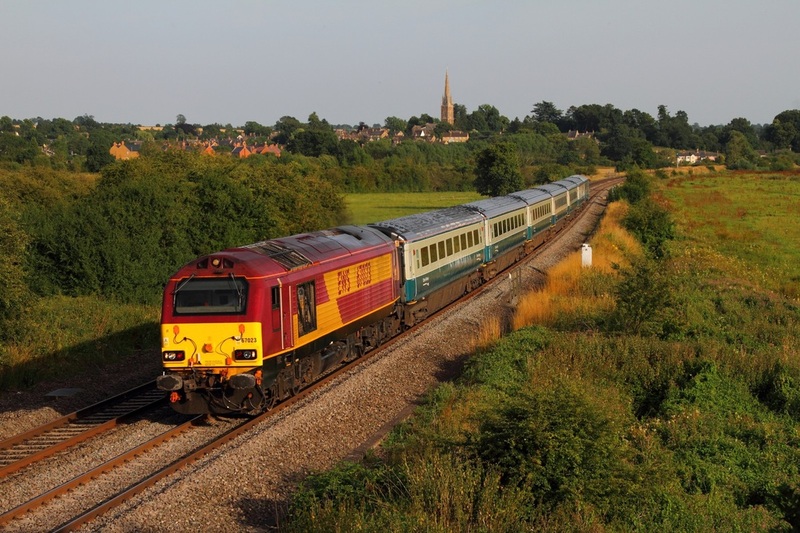 67014 leads the 1K65 1945 London Marylebone to Kidderminster at Kings Sutton on the 18th July 2014. Freightliner's 70018 hauls the 4M99 Southampton to Trafford Park at Kings Sutton on the 18th July 2014. DB Schenker's EWS coloured 67023 leads the 1U61 1750 London Marylebone to Banbury at Kings Sutton on the 18th July 2014. 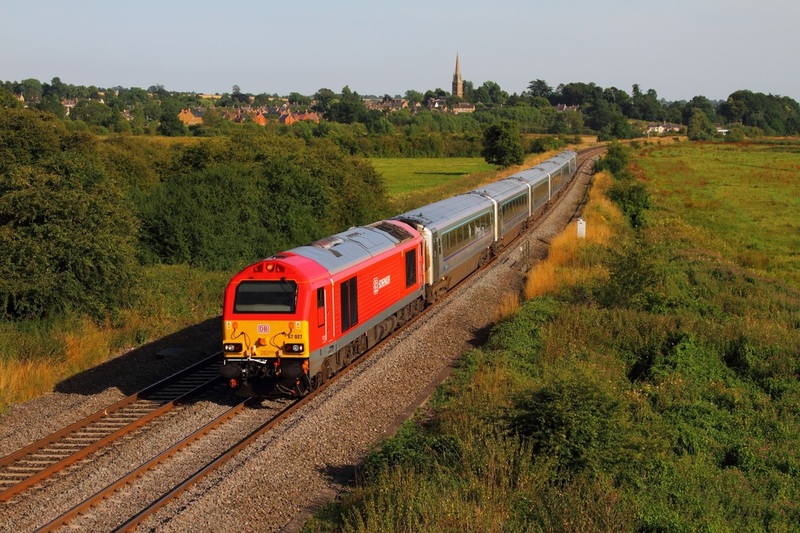 DB Schenker's 67027 hauls the 1K57 17:15 London Marylebone to Kidderminster at Kings Sutton on the 18th July 2014. 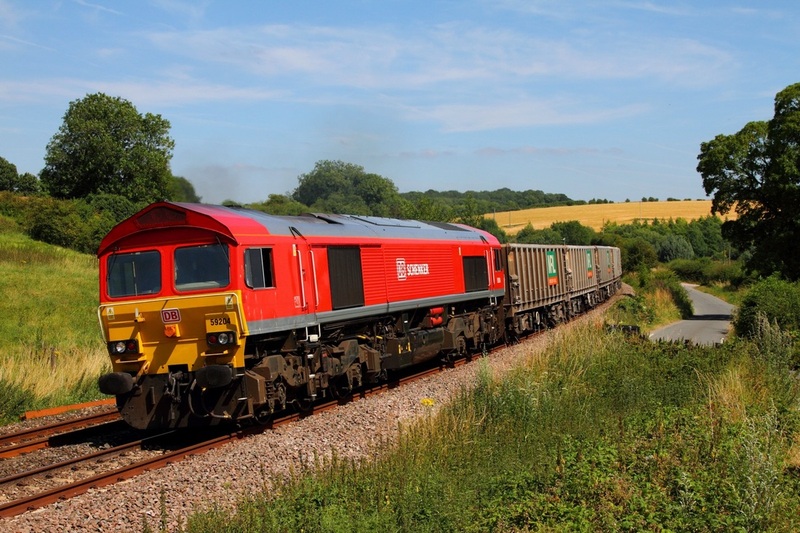 Aggregate Industries liveried 59005 powers through Bedwyn hauling the 6V18 Hither Green to Whatley on the 18th July 2014. 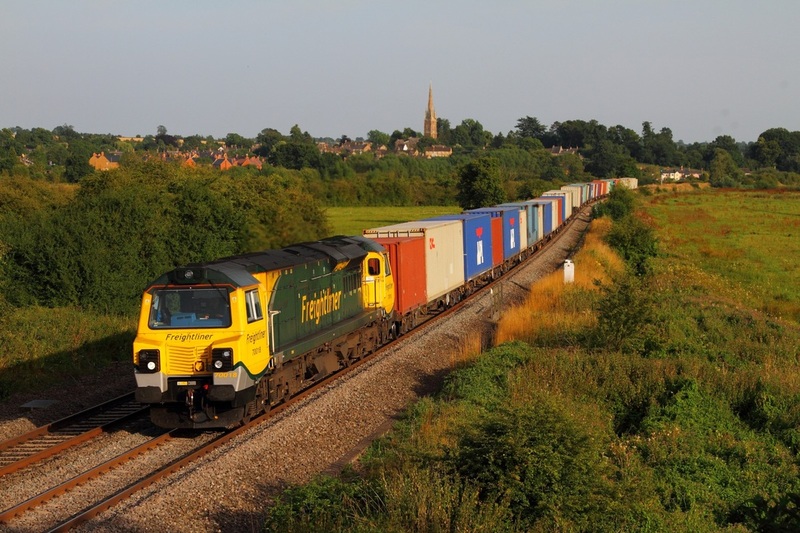 DB Schenker's 59204 hauls the 7C77 Acton Yard to Merehead at Bedwyn on the 18th July 2014. 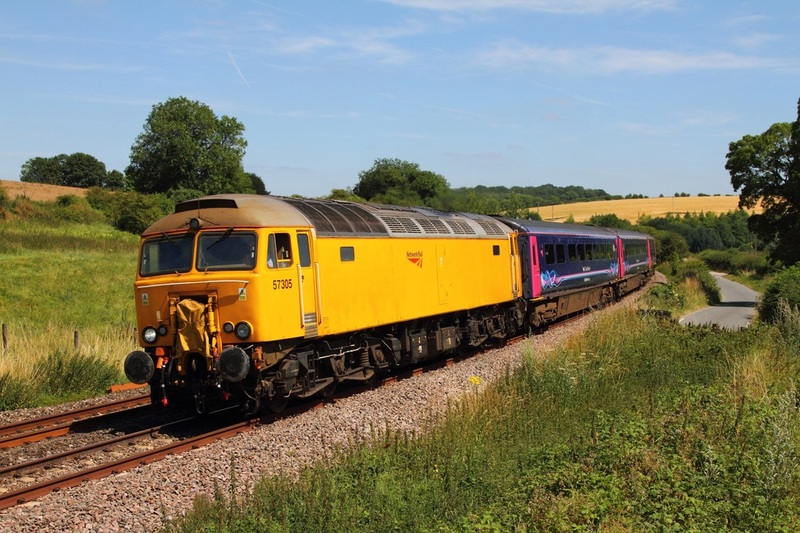 Network Rail liveried 57305 hauls the 3A40 Old Oak Common to Penzance sleeper ECS at Bedwyn near Woodborough on the 18th July 2014. 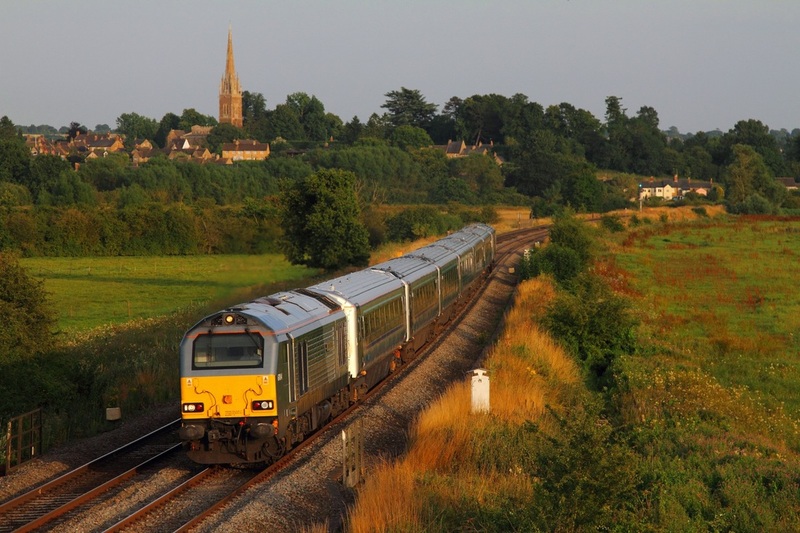 The overnight 1C99 was a HST due to problems with the stock. 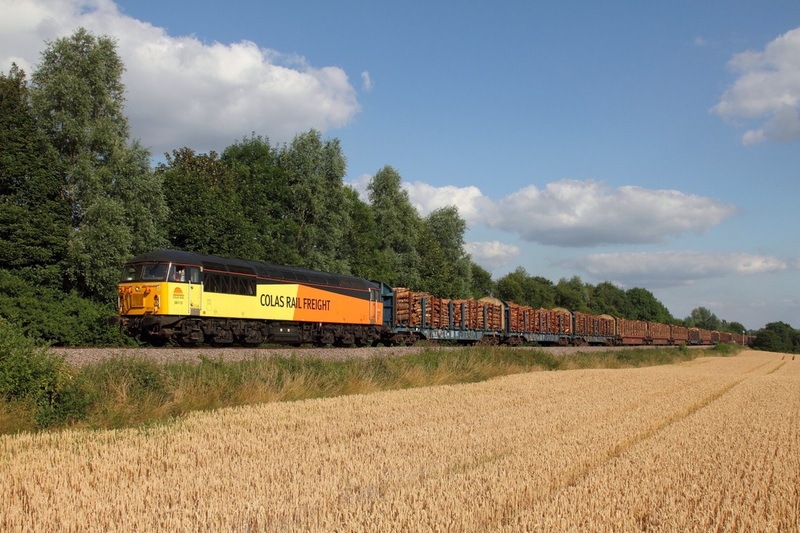 Colas Rail 56113 hauls the 6M51 Baglan Bay to Chirk loaded timber at Llanellen, Abergavenny on the 17th July 2014, running about 28 minutes late. 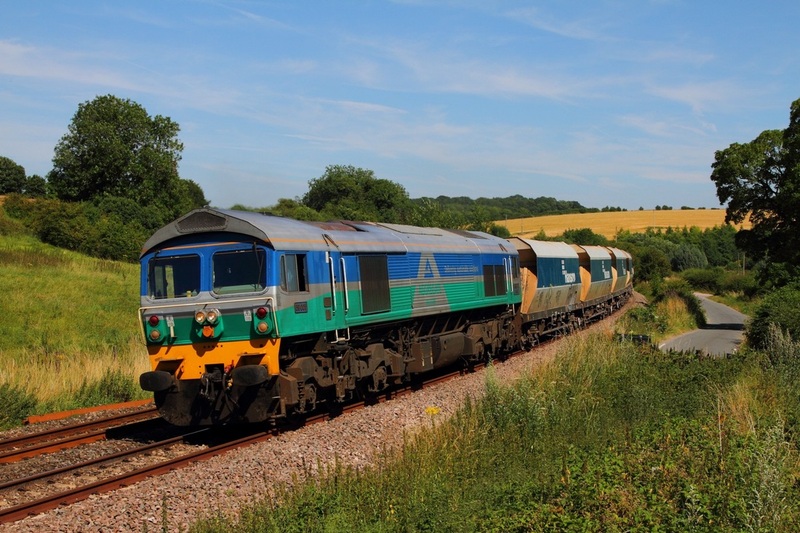 DB Schenker's 60040 powers the 6B13 Robeston to Westerleigh loaded murco bogie tanks at Gatcombe on the 17th July 2014. 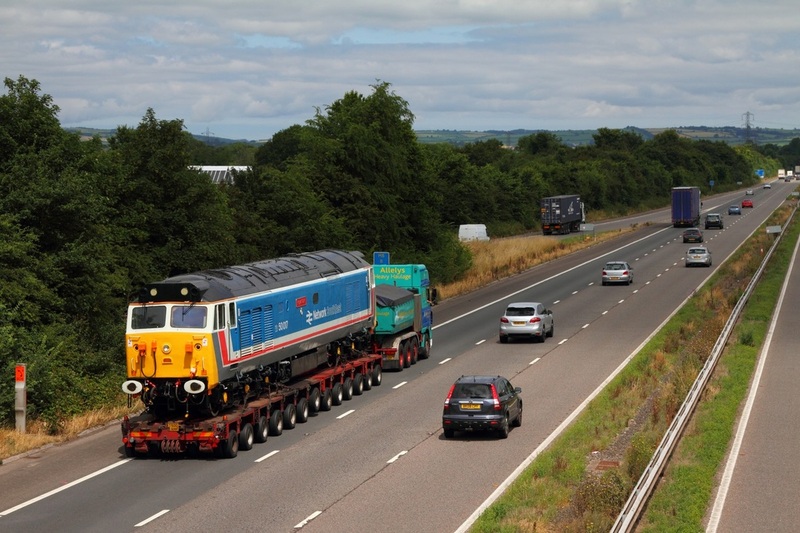 Network South East liveried 50017 is captured on a low loader on the M5 going from the Plym Valley Railway to Washwood Heath on the 15th July 2014. 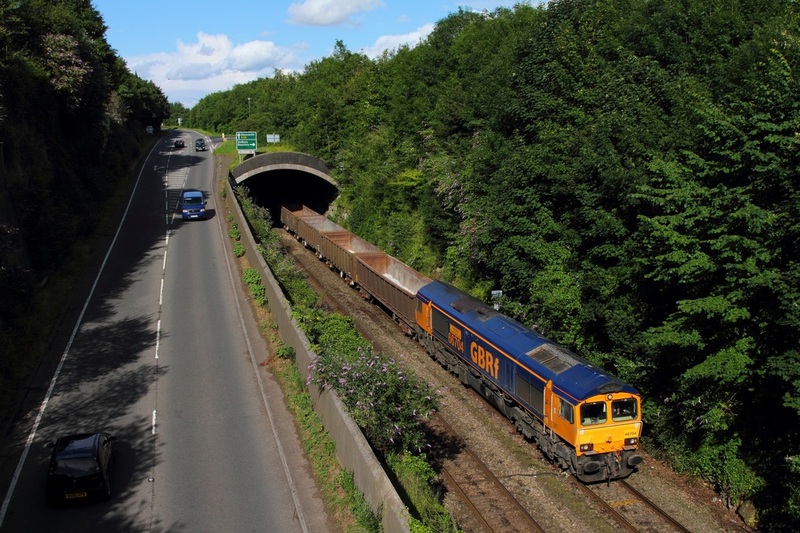 GBRf new sheds nos. 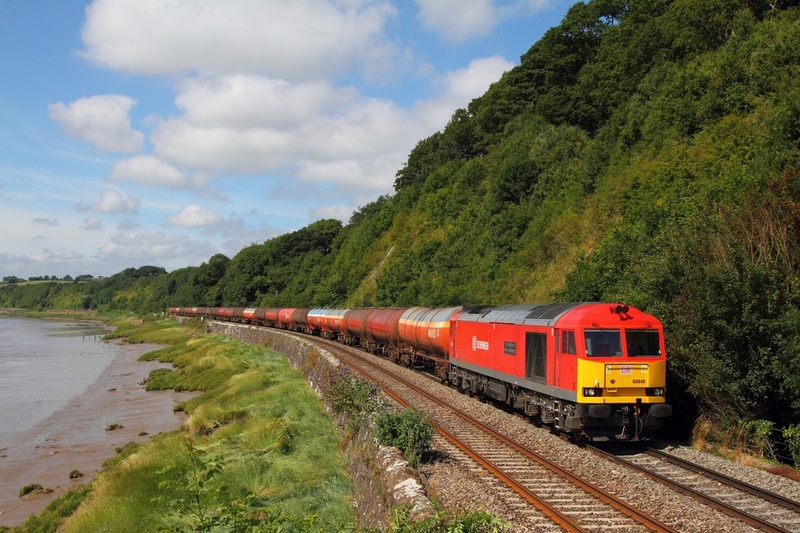 66755 (closest to the frame) brings up the rear from 66756, 66754 66753, 66752 and the lead loco 66737, which is hauling the convoy as the 0X66 Newport Docks to Doncaster, captured here off the M48 Severn Bridge on the 12th July 2014. 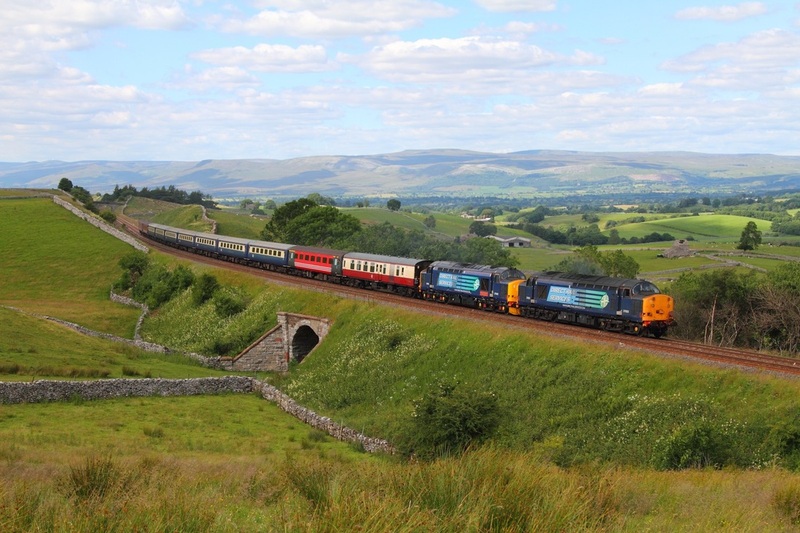 48151 works the 1Z53 Carlisle to Lancaster at Birkett Common on the 9th July 2014. 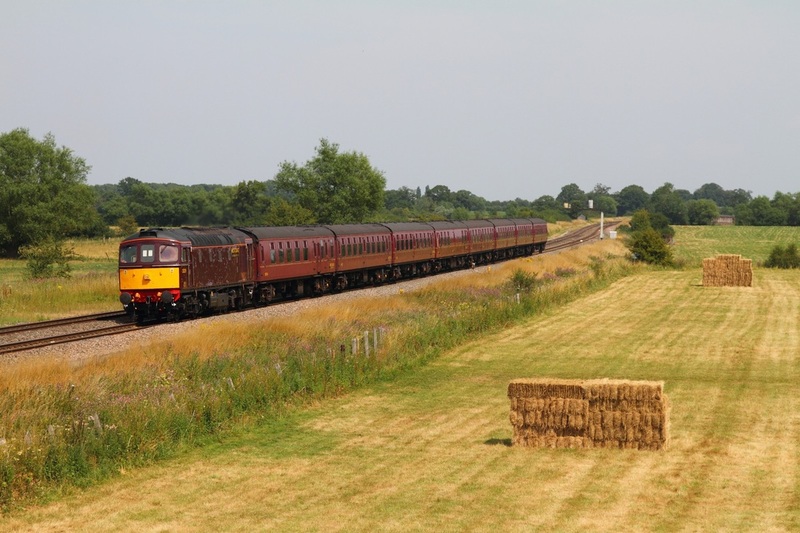 DRS 37603 leads 37402 on the 1Z82 Carlisle to Taunton Pathfinder railtours at Birkett Common on the 9th July 2014. 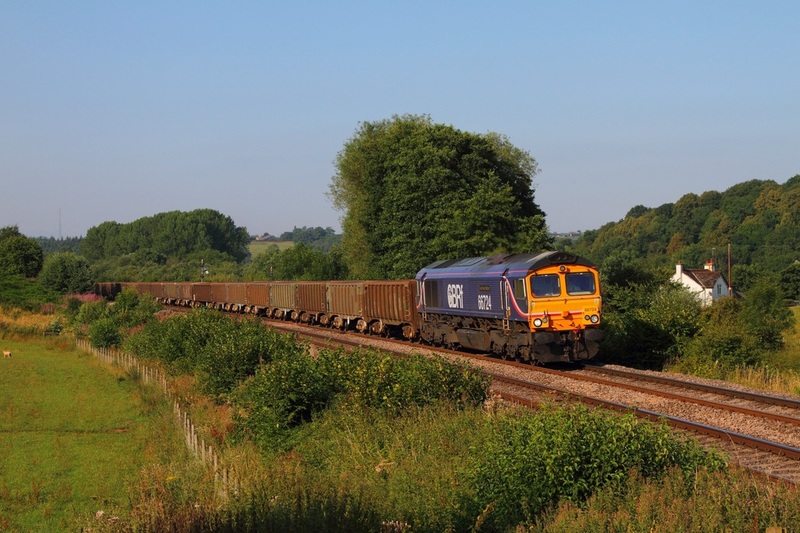 Right: GBRf 66704 leads 6V83 Peterborough to Moreton on the Lugg stone train at Sedbury on the approach to Chepstow on the 8th July 2014. 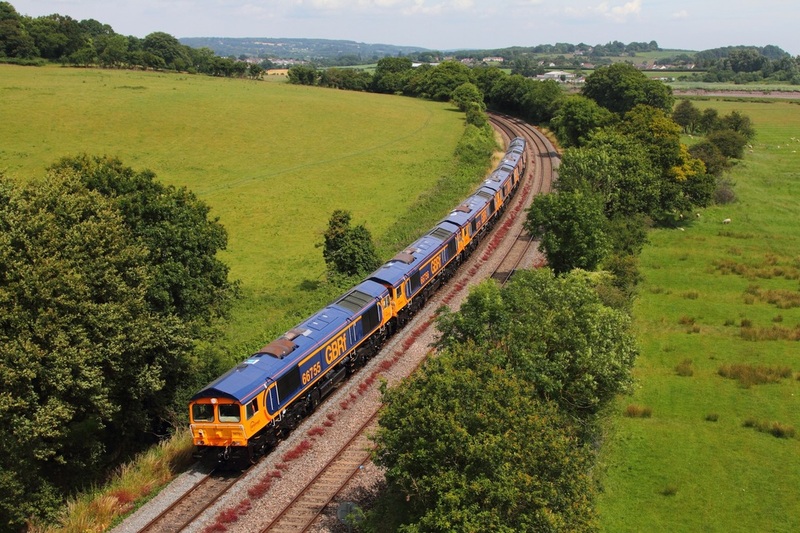 Above: Astonishingly 66704 was held behind Severn Tunnel junction on the relief for over an hour to awaiting time, having gone to Undy just expecting 6X52, the GBRf bluebird trundles down the relief behind 66144. 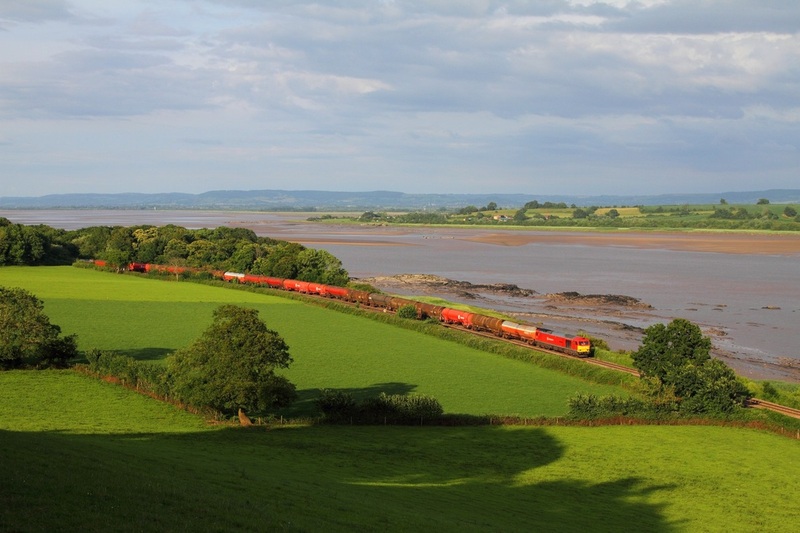 DB Schenker's 60019 passes Purton hauling the 6B47 Westerleigh to Margam on the 7th July 2014. 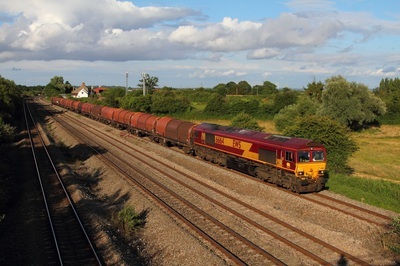 Colas Rail liveried 56087 leads 56105 on the 6V62 Tilbury to Llanwern steel at Pilning on the 7th July 2014. 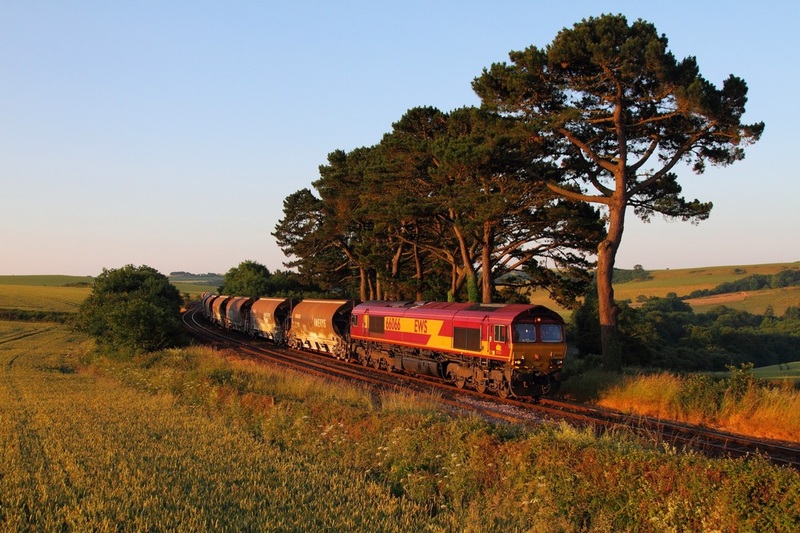 DB Schenker's EWS liveried 66066 leads the 6C99 Newport A.D.j to St Blazey china clays at Trerulefoot south of Plymouth on the 2nd June 2014. 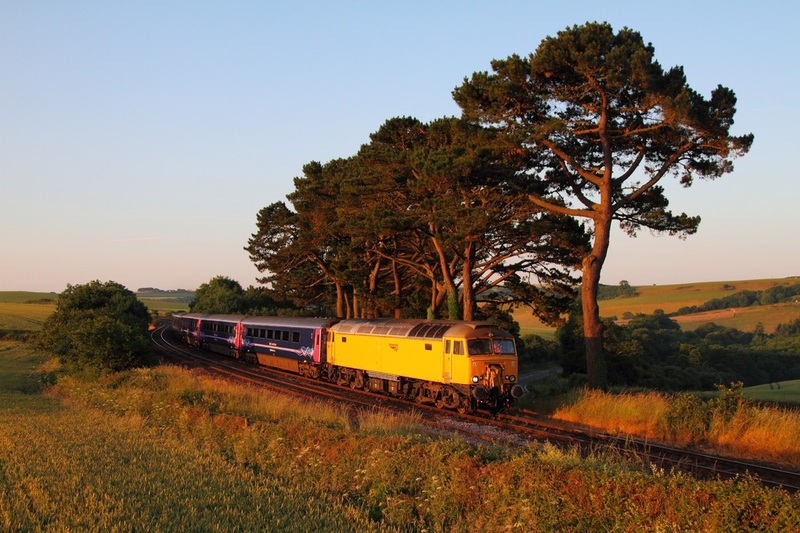 Network Rail's 57305 currently on hire to First Great Western, works the 1C99 London Paddington to Penzance at Trerulefoot south of Plymouth on the 2nd July 2014.